I'm guilty. Guilty of steering my 12-year-old daughter towards a love of reading and writing and photography - all of the pursuits that I enjoy and have always believed I'm good at. Recently she told me, "I actually really like science." Alarm bells went off in my head. I was happy to hear she liked science. But a realization dawned on me - had we done nothing to encourage her to explore pursuits such as science, technology and math? Sure she has had a science kit or two, but did we ever sell any of these traditionally male subjects as career options? Fortunately there's still time. I would love to see her take courses exploring coding, science and math. Recently she and I attended an event hosted by Level Up Kids. They conduct camps for kids throughout Canada. 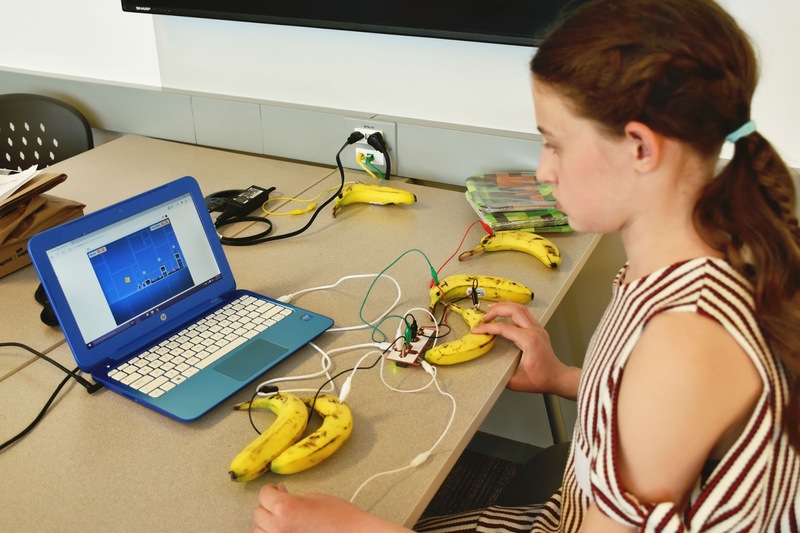 These are camps with a difference - they are not just fun and engaging for kids - they also help prepare kids for the jobs of the future, encouraging children ages 8 to 15 in STEM education. My daughter was so absorbed in the event - creating a hide and seek game with Scratch and programming with Minecraft - that she didn't want to pause for a moment, When she asked me to throw something in the garbage for her, I told her the garbage can was right outside the door. She gestured a little madly towards the laptop she had been using and uttered, "But I'm..." before rushing back to her project. How could I object? 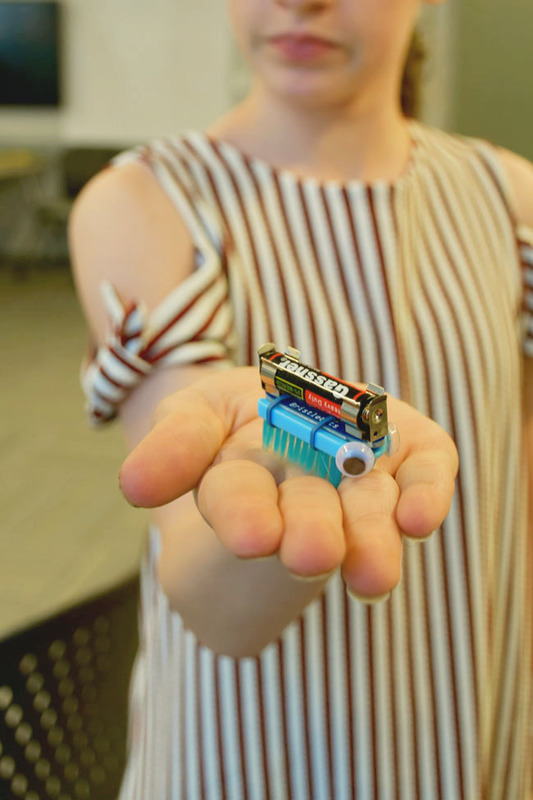 The kids also learned they can make their own moving toy using the head of a toothbrush, the device that makes your smartphone vibrate, a couple of elastics, pipe cleaners, a battery and of course some googly eyes for added fun. They also explored an area where Level Up staff had connected bananas (yes, bananas!) to a circuit board. The kids would hold a grounding wire in one hand and press on the bananas to move the character in an onscreen video game. Pretty much whatever job you choose in the future will include technology of some kind. With the vast changes in technology since I was a child (soooo long ago! ), I can't even begin to imagine what areas of tech our kids will work in. Jeff from Level Up told us that many countries offer technology as part of the curriculum from Kindergarten on. That's not the case here in Canada. And technology helps kids learn to solve problems in other areas as well. It's important for children, and girls in particular, to be exposed to the world of technology before they consider their high school course options. According to this report by Statistics Canada, women represent the majority of university grads, but are still underrepresented in some areas of science, technology, engineering, mathematics and computer science (STEM). While women made up 59% of those in science and technology programs (among STEM graduates ages 25 to 34), they accounted for only 30% of math and computer science grads and 23% of engineering grads. If we want technology to benefit everybody, then surely we need the perspective of women. Level Up's Jeff, who himself has two young daughters, told us that through watching kids in Level Up classes, he has noticed that girls want to make a difference through coding, while boys are often caught up in play. The girls also use Minecraft to make something beautiful. More diverse voices in tech can only mean we all benefit - from additional creativity, problem-solving and critical thinking skills. With women making most of the household purchasing decisions, it only makes good sense for companies to have women represented. Girls can begin to close the gap in pay equity by pursuing careers that have traditionally been dominated by men. According to this article in The Atlantic, the tech industry in the US pays an average of $93,800 (as of 2012) annually. At Level Up Kids, more instructors are female than male, thus providing a strong example for the students. All of the instructors are adults, most of them computer science or education students. Classes have a ratio of 1 instructor to 10 students. Reason abstractly and quantitatively. Students learn to break down complex problems into simpler ones. Construct viable arguments and critique the reasoning of others through collaborative problem-solving. Model with Mathematics, using X and Y coordinates, spatial directions, shortest paths, measurements and more. Use appropriate tools strategically. 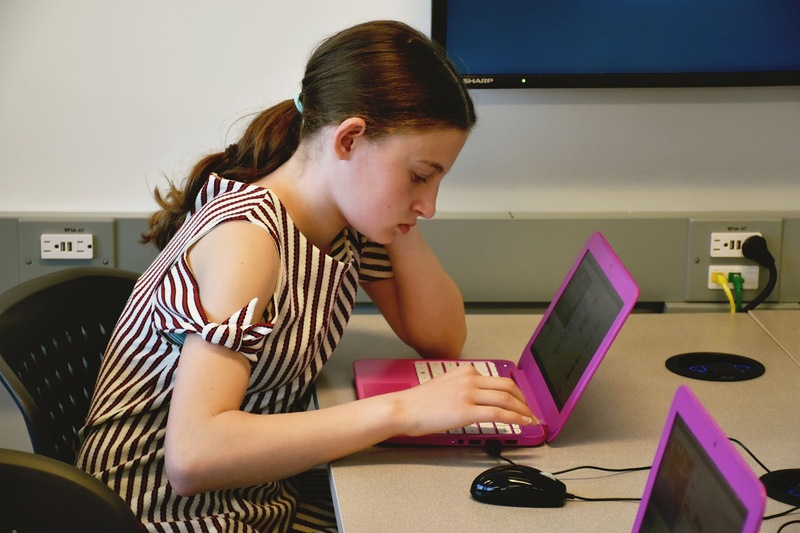 Students learn that the appropriate tool can save them time and effort when programming. Be precise, in order to carefully write and format a computer program that works effectively. Look for and make use of structure, a fundamental component of computer programming. Students learn that finding a pattern simplifies the logic and makes finding a solution easier. Look for and express regularity in repeated reasoning. They learn to use solutions to previously solved problems to tackle more complex problems. It's time to book your summer camps! You know those eager beaver parents started booking camps back in January, so head over to the Level Up site and see the camp programs still available this summer. There's even a camp for future YouTube stars! Win a free week of Level Up Kids camp! If you live in Canada, check out the Level Up Kids site to see if there's a camp program in your area. Enter here for the chance to win a free week of camp! Wouldn't it be nice to free up some cash this summer and still keep your child busy and engaged? Enter using the rafflecopter below until June 13th. *This post is part of the YummyMummyClub.ca and #LevelUpKids sponsored program. I received compensation as a thank you for my participation. This post reflects my personal opinion about the information provided by the sponsors. My son would love the Minecraft camp! Awesome giveaway! That sounds like a fun camp for sure! :) Thank you! My daughter would love to attend the Minecraft Adventure Camp. That would be so much fun! Good luck! My granddaughter would love Coding Girls Camp. I think my daughter would like that one too! My son would love YouTube Camp! Thanks for the chance! The YouTube camp sounds really cool! You're welcome! It's amazing how much kids love Minecraft! My nephew would love the Minecraft camp. Minecraft Adventure would be perfect! I think this is wonderful especially since my only daughter is 12yrs old!! She would love the YouTube Camp or Robotics but they all sound fun! I think this is great idea for the robotics camp. My son would absolutely enjoy the adventures in programming!